Fiat puts Panda Cross on sale | What Car? 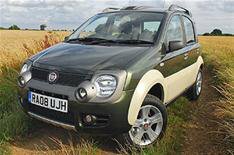 Fiat has put its off-road Panda Cross on sale in the UK from 11,995. It is powered by a 70bhp 1.3-litre diesel engine, and averages 54mpg while emitting 136g/km CO2. Based on the existing Panda 4x4, the Cross has more rugged styling and a higher ride height. Visual changes to the standard car include chunky side protection strips, reworked bumpers, new headlights, roof rails and 15-inch alloy wheels. It has previously only been available in mainland Europe.